5) A beautiful beach that you can gradually walk into the water from. 9) Year round use, gas fireplace & individual room electric heat. We pray you and your family will enjoy our slice of renters paradise and make many, many great memories. 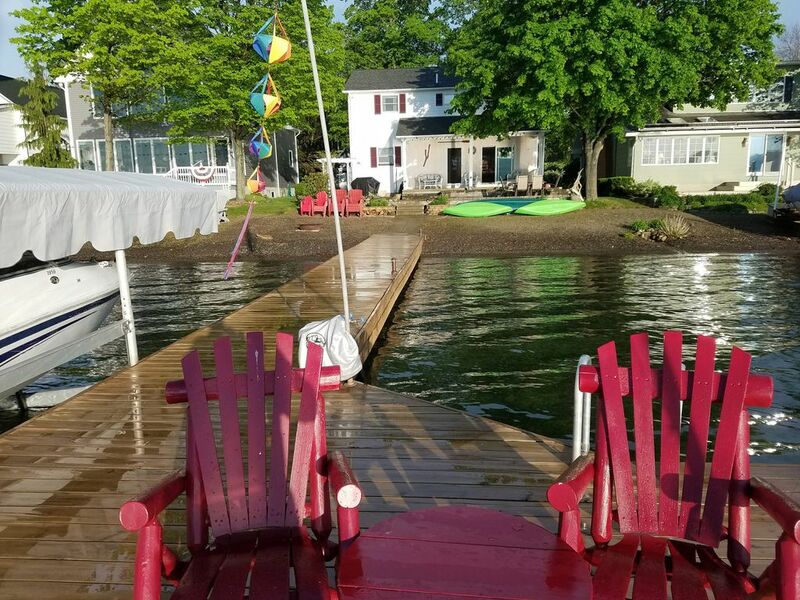 We LOVE Keuka more than any lake we have ever been to because of the crystal clear weed free water, the beautiful views, the multiple restaurants on the lake and 7 miles from the quaint village of Hammondsport. After renting at Keuka for over 20 years we finally took the plunge and purchased our slice of Keuka Paradise. 9551 Crystal Beach Rd Hammondsport 14840 Our cottage is on the coveted East side in the cozy private community called Crystal beach. After renting various cottages for over 20 years which each had between 15 & 60 steps from parking to the lake. We are now located on a level lot with no steps from the parking lot to the beach unless you go through the house and have 2 steps on one side and 5 on the other. With 5 bedrooms, and 2 bathrooms and the ability to sleep 14 people it has plenty of room for one large family or even 2 or 3 smaller family's. We have rented 1 bathroom cottages and need I say 2 bathrooms are a MUST have. We have also rented places with only 2 parking spots and now we have more than ample parking. Also some cottages had room for us to sleep but not enough room for us to sit in a living area together. Our family room / dining room area can seat 14+. We are a year round cottage with both a gas fireplace and individual room electric heat along with air conditioning in all 5 bedrooms. Beautiful gradual sloping pebble beach, no steps. Large dock. We have a gradual walk-in pebble beach. The water is clear, weed & rock free. There is a large permanent dock that you can jump off of or sit on. We also have the most beautiful view on Keuka. We have window A/C units in all 5 Bedrooms. Also all rooms have both ceiling & box fans. Has gas stove that heats the whole house but also has individual room electric zone heat. 3 car garage, left bay has bikes, kayaks & toys for renters. Right 2 bays are not for renter use. Some kids toys in Bedroom 5 & Left garage bay. We have a good size 40' x 50' 'lawn north & east of the 3 car garage and a small lawn area on both sides of the driveway by the house. We supply 10 life-jackets of various sizes. We had a wonderful stay at It's a Grape Life! With 6 adults and 3 12 year old boys we felt comfortable, even when we were all crowded around the dining room table. It was great having a full kitchen and it was very well supplied. I didn't find myself missing anything other than a basting brush and a quick trip out to the grill took care of that. Unfortunately the weather prevented me from using the grill by the lake. The kids loved the dock and spent a number of hours skipping stones off the end. We only had one kind fall in and he was out of the 45 degree water pretty quick. Since I'm talking about outside, we loved the patio and the fire table. we spent our first evening sitting outside by the table talking and listening to the lake. If the weather had been better we would have spent the next evening around the fire pit on the beach. As for bed rooms we had more space than we needed. The bed rooms were all large and comfortable. I didn't hear anyone complaining about the beds being uncomfortable. All in all, I wouldn't hesitate to recommend It's a Grape Life to friends looking to spend time in the finger lakes region. Amazing home and Keuka Lake is a stunning view right outside the window. Every detail is thought of! It’s A Grape Life is a gorgeous lake home equipped with everything we needed for a lovely weekend retreat, and it was such a pleasure to be cozy warm in February while enjoying the views of Icy Keuka Lake. We had 10 guests and the home still felt huge! The kitchen is well supplied with everything we needed, from quality cook wear and wonderful appliances, to an abundance of dish and silver ware, and a dishwasher to make clean up a breeze. The home is sparkling clean, and the beds were so comfortable. The bathrooms were spacious, and well supplied. Abundant Parking for 6-8 vehicles, with two spaces right at the door was an unexpected bonus! A full bedroom and bath on the main floor is a wonderful perk for the few guests who struggled with stairs and everything needed was on the main level. There is a huge family table in the dining room that easily accommodated all of us, and a large sliding door with a gorgeous deck right outside. Even in February, the view was so inviting that a few of us ventured out and enjoyed the brisk breezes of the lake! Games for the family, great WiFi and plenty of comfortable seating in the living room. Summer or Winter, If you need a weekend getaway, or an extended stay, It’s A Grape Life is highly recommended! We had a fantastic stay at Its a Grape Life. We had 3 couples, a mom and toddler, and 4 "big" kids (ages 12-10). The bunkbed room was perfect for the "big kids" and the toddler slept with her mom. The downstairs bedroom was perfect for our parents. The house was as described and as shown in the photographs: very clean, well stocked with respect to old fashioned games and with respect to kitchen tools/dishes, and plenty of chairs (inside and out) for everyone. We all sat together for meals around the kitchen table (we all fit), and we cooked all our meals without difficulty in the kitchen. It was also nice that each bedroom has its own thermostat. The parking is as roomy as described, and the dock and back area are excellent as well. It was cold while we were there, but the kids still enjoyed some fishing and we enjoyed a nice fire and s'mores. Fantastic place with a beautiful view. Everything that you could want is here. A lovely home on a beautiful lake. We visited between Christmas and New Year’s. It was everything that we could want and just what we needed to satisfy 6 adults and 5 children under 7. Lots of room for the kids to play, and the room with the double bunk beds was perfect for the 3, 4 and 6 year olds. The 15 month old twins got a quiet bedroom to their selves, so nap times were great. We would certainly recommend It’s a Grape Life to anyone. Rick made sure that we were looked after, and we really appreciate his attentiveness. Great experience will definitely stay here again. * Racing: Grand Prix, NASCAR and Dirt Stockcar. * Boating: Sail & Power. * Fine dining on the water. * Hiking to many waterfalls. * Sunbathing on 100' dock. Fine dinning by boat at many restaurants on the water!